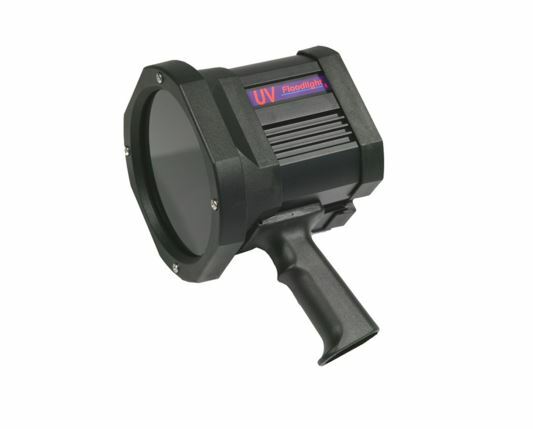 A large beam, compact size, and light weight are the key characteristics of the perfect portable UV tool. BigBeam has it all! The Labino BigBeam is designed to provide its users with a smooth and wide light beam. 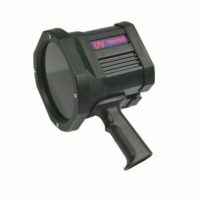 This hand held lamp is based on LED technology and offers you very narrow spectra with a peak wavelength of 365 nm. 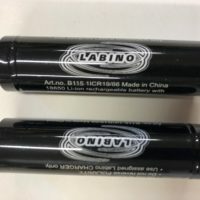 This product is available in two versions, as Battery and Mains (DUO) or just Mains. The DUO is battery operated, but it is possible to run the unit via mains while charging the battery. Each DUO unit is equipped with a current regulator to keep the intensity steady when the battery fades. The DUO weighs 1.7 kgs (3.74 lbs). The mains model is equipped with a 2-meter long extendable cord. The mains model weighs 1.2 kgs (2.64 lbs). All BigBeam units are equipped with a white light block filter which helps the lamp emitting almost no visible light. 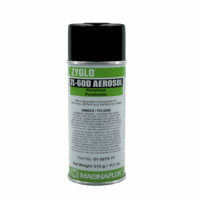 It is compliant with ASTM UV-A intensity and wavelength specifications for FPI and MPI. BigBeam is available in two different beams, Floodlight and Midlight. BigBeam is also available with a carrying case for your convenience of carrying it at the inspection area as well as with a cable winder.